Open Daily 11:30 a.m.- 2 a.m.
Where main street begins and the fun never ends! Located 7 blocks south of the World's Only Corn Palace in Mitchell, SD. 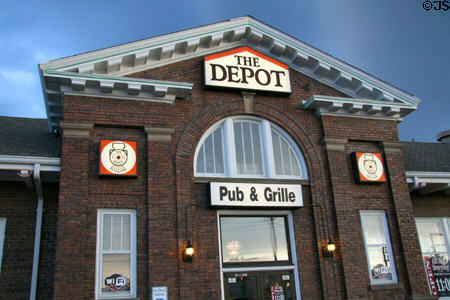 The Depot features a full selection of menu items including burgers, steaks, BBQ and more! Built in 1909 at a cost of $40,000 as the Depot of the Chicago Milwaukee and St. Paul Railroad, it was used over 40 years for passengers and freight. It sat empty for many years, was beautifully renovated in 1990, and is now registered as a historical ''site.'' Once again it is full of activity and is now The Depot Pub and Grill.